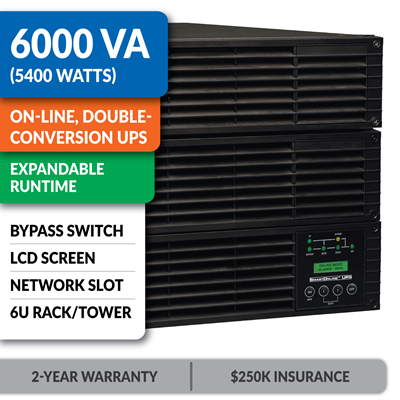 Tripp Lite SU6000RT4UTFHW 6000VA / 6kVA / 5400 watt on-line, double-conversion UPS system offers complete power protection for critical server, network and telecommunications equipment in a 6U rack/tower compatible configuration. Full-time active power conditioning provides clean, continuous dual-conversion AC output free of voltage fluctuations, power interruptions and line noise. Fault-tolerant auto-bypass prevents unexpected service interruptions during UPS overload or internal fault conditions. Detachable back panel PDU with manual bypass switch supports hot-swappable UPS power module replacement with no interruption to connected equipment. 4U UPS power module and included 2U low-voltage transformer install in only 6 rack spaces total (6U) with a maximum installed depth of only 21.8 in. / 55.3 cm. Maintains full-time sine wave output within 2% of selectable 208/240V and 120V nominal at 60Hz during brownouts as low 100V and overvoltages as high as 300V. Expandable runtime is supported with optional BP192V12-3U external battery packs. Battery independent restart ensures automatic UPS power-up without userinteraction after lengthy power outages, even when batteries are expired and require replacement. Double-conversion operation converts raw input from AC to DC, then resynthesizes output power back to perfect sine wave AC with enhanced protection from harmonic distortion, fast electrical impulses and other hard-to-solve power problems not addressed by other UPS types. Highly efficient operation in optional economy mode significantly reduces BTU heat output and operating energy costs. Network-grade AC surge and noise suppression. Supports detailed monitoring of equipment load levels, self-test data and utility power conditions via built-in RS-232 and USB interfaces. Optional SNMP/Web and contact-closure communications card accessories available. HID-compliant USB interface enables integration with built-in power management and auto shutdown features of Windows and Mac OS X. Included PowerAlert monitoring software offers detailed site power and UPS updates with support for safe auto-shutdown of connected systems as UPS batteries become depleted. Included software packages include PowerAlert Local, PowerAlert Network Shutdown Agent and PowerAlert Network Management System for complete support for a wide variety of application types. Supports Emergency Power Off (EPO) via built-in interface. Front panel LEDs and LCD readout with scroll controls support front-panel visual monitoring of all major UPS for a variety of control options to support advanced UPS settings and configurations. LED / LCD display panel rotates for viewing in rackmount or tower configurations. Hardwire input. Hardwire UPS output, plus 1 L6-30R, 8 5-15/20R and 4 5-15R outlets. External battery packs are field replaceable and hot swappable. This on-line, double-conversion UPS system protects critical network systems from damage, downtime and data loss. True on-line, double-conversion operation delivers pure sine wave output, precise voltage regulation and isolation from power problems. Bypass switch allows UPS power module to be removed for maintenance, repair or replacement without requiring connected equipment downtime. LCD/LED control panel displays power conditions and permits easy access to settings. USB and DB9 serial ports connect to computers for power management. High-voltage output and low-voltage transfomer provide wide-ranging equipment compatibility. 2-year warranty and $250,000 insurance reflect commitment to reliability. The success of your organization depends on critical information systems like servers and network hardware. If your critical systems don't have reliable power, employees can't work, communications go down, automated systems malfunction and productivity grinds to a halt. It would be nice if utility power was always reliable, but it isn't. Between severe weather, the aging electrical grid and hazards lurking inside your own walls, your servers and network hardware are under attack from power problems. Even a brief loss of power or a momentary surge can damage your equipment, corrupt your data, bring down your network and hurt your bottom line. 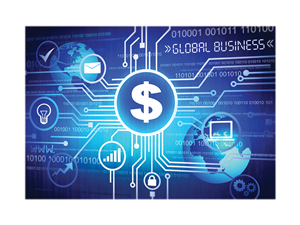 The potential costs of downtime are alarming. Surveyed averages range from $1,167 per minute for mid-size businesses (IDC) to $7,908 per minute for larger operations (Ponemon Institute). For a tiny fraction of these costs, you can prevent damage, downtime and data loss by installing this SmartOnline UPS system. True on-line double conversion is the highest level of power protection available. It provides precise voltage regulation, delivers continuous sine wave output and isolates equipment from power problems. This UPS system also has a high power factor, allowing you to connect a heavier load without overloading the UPS. Active PFC power supplies found in many devices require sine wave power. Half-Load Runtime: This UPS system will support a 50% load (2700W) for up to 8.5 minutes using the included batteries. Extended Runtime: This UPS system allows you to connect one or more optional external battery packs to provide additional backup runtime. Some external battery packs can also be daisy-chained, allowing you to scale runtime to match almost any application requirement. Continuous on-line, double-conversion operation provides precise voltage regulation and sine wave output. It isolates connected equipment from most power problems, including blackouts, brownouts, overvoltages, transient voltage surges, electromagnetic (EMI/RFI) line noise, harmonic distortion, electrical impulses and frequency variations. Zero transfer time to battery prevents malfunctions and reboots of sensitive equipment potentially caused by the transition from line power to battery-derived power during outages. Fault-tolerant automatic bypass maintains utility output and avoids downtime during a variety of fault and overload conditions. All SmartOnline UPS systems have hot-swappable batteries and an automatic internal bypass that delivers power directly to connected equipment in the case of an internal fault or severe overload. These features support the continuous availability of critical systems like servers and network hardware connected to the UPS. This UPS system also includes a detachable PDU with bypass switch to provide even higher system availability. When the switch is set to "bypass," you can completely remove the UPS power module for maintenance, repair or replacement without requiring downtime. The detachable PDU remains connected to the AC input power source and continues to supply power to connected equipment. The convenient LCD/LED control panel provides easy access to detailed UPS settings and information. The illuminated LCD screen displays a variety of helpful data, including input/output voltage, input/output frequency, load level and battery level. An LED block diagram supplements the LCD screen by indicating the UPS operating mode and power conditions. The control panel also allows you to change the UPS system's operating mode and other settings. The control panel provides more information and greater control than comparable models, allowing you to diagnose and respond to power problems at the rack before they cause downtime. Economy Mode: This UPS system provides user-selectable economy mode operation to increase efficiency and cut operating costs. In economy mode, the UPS system suspends double conversion and operates with increased efficiency as long as input power quality is satisfactory. If input power quality becomes unsatisfactory, the UPS system immediately resumes double conversion until power quality returns to normal. 2-Year Product Warranty: If this UPS system (including the internal battery) proves defective in material or workmanship within that period, Tripp Lite will repair or replace it at no charge.